Playing and splashing around in water is something that kids of all ages love to do. Teaching kids how to swim is a pleasure. However, when kids want to play in the pool but are not completely toilet-trained, it poses a problem. Babies and toddlers benefit immensely from water play. Their gross and fine motor skills will increase through splashing, squirting, stirring, and learning to swim. If your toddler is not toilet-trained, health concerns will prevent him from using public pools. This is why we bring you our top 8 picks for best swim diapers to choose from because fun in the water for babies and toddlers should not stop due to bodily functions. Our very first pick for fun and useful swimsuit diaper is presented to you by iplay. The simple but effective design can be worn on its own or underneath regular swimwear. The three-layer design is lightweight, stretchable, and has well-trimmed seams, making it a popular choice for parents looking for diapers for swimming. This diaper comes with user-friendly snaps that stay in place and lock easy. Washing and maintaining instructions should be followed for increasing the durability. Made with 100% polyester, the design and pricing make this a best-seller. Comes with a snap closure. Washing machine and dryer friendly. Locks smells and moisture for quite long. Does tend to run small in size. May tear if not used with care. You will like this because of the ease of movement while your baby splashes happily in the water. More concerned parents will love the fact that you can reuse these and also the product is free from formaldehyde and dyes used are AZO-free and UPF 50+. Alvababy presents the next pick for good quality baby swim diapers. It is gender-neutral and comes in several sizes. These diapers are reusable. This adjustable diaper is made with waterproof polyester from outside, and skin-friendly cloth-polyester mesh from inside. The 3×3 snap feature makes this diaper a snug fit for your child and keeps it in place while your kid plays in the water. Fit can be customized according to the shape and size of the baby. Can be worn on its own or beneath a swimsuit. Side snaps to facilitate easy cleaning. Snaps may come off if used carelessly. 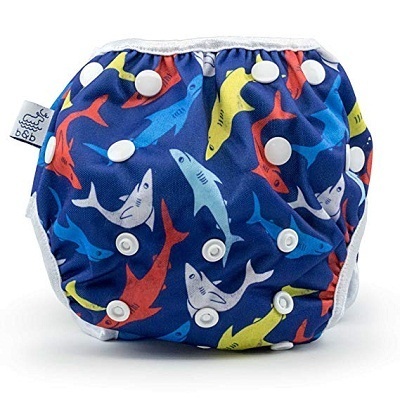 These swim diapers are available in a variety of cute designs multiple sizes. Easy maintenance and multiple snaps ensure that both you and your baby are happy with this choice. The quick-dry feature makes it a perfect accessory while traveling. This next product is a classic design for parents looking for a good swim diaper according to size, growth and weight. The pull up classic design comes in multiple shades, ranging from sober pastel shades to attractive prints. 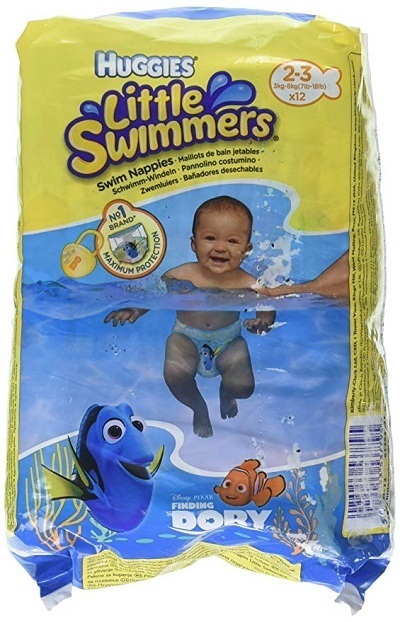 The swim diaper is made of polyester and is chlorine-resistant. These lightweight diapers are travel-friendly and machine-washable. They are reusable and can be fitted under a regular diaper for the more cautious parents. It has sufficient padding and absorbency to keep your kid comfortable. Snug fit for good results. Leg holes are designed for ease of movement. Easy to wash and take around. Pull up that can be easy to change. Size should be chosen properly. Extreme tight fit may give elastic welts to the skin. Apart from the perfect fit and absorbency, parents of older, potty-trained kids can use these because pool rules may require little kids to wear a pull-up diaper. It is also chlorine-resistant, protecting your baby’s sensitive skin. 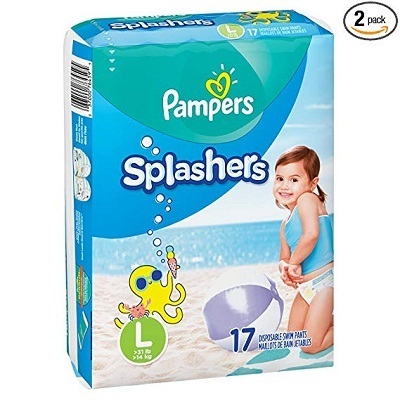 Next up on our list for baby pool diapers is brought to you by Pampers. Made with lock-smart technology, with easy side-peel, this disposable diaper is perfectly handy for quick change during pool time fun. The snug choice will keep your baby comfortable while splashing around in the water. This diaper can also be worn below a swimsuit or on its own. The waistband stretches to make it comfortable for your baby’s sensitive skin it is easy to change even on the go. This diaper will never swell, unlike regular diapers, no matter how wet your little one is. Elastic waistline makes this diaper easy to pull up and down. Disposable diapers that you need to wrap carefully and throw. Can be worn with or without a regular swimsuit. Easy-Tear side technology to make changing a breeze. May prove to be rather expensive in the long run. Cannot be used more than once. Size may be an issue unless properly picked. Pampers is one of the best diaper brands that you can trust; their swimming diapers are also of high quality. The best technology is used to make these diapers skin-friendly. Gender neutral and trendy, Wegreeco is one of the best reusable swim diapers brand available in the market today. It is stretchable and made from polyester. The insides are made with fine soft mesh that will contain pee or poop without sagging or swelling. The diaper comes with multiple snaps, making it free-size for children up to 36 months of age. The diaper has been designed for heavy duty use but is lightweight. Trimmed design and high-quality waterproof material used. Soft elastic to ensure your kid’s skin is free of abrasions. Reusable and free sized courtesy of easy-lock snaps. May tear if not handled with care. Unless adjusted properly, may pinch kid’s skin. One of the biggest reasons is how environmentally-friendly these reusable diapers are. Another big factor is that these are extremely easy to wash, dry and use. More than one in a pack enables your kid to sport a new one when desired. This swim diaper has been designed exclusively for girls and also serves the dual function of being an adorable one-piece swimsuit. 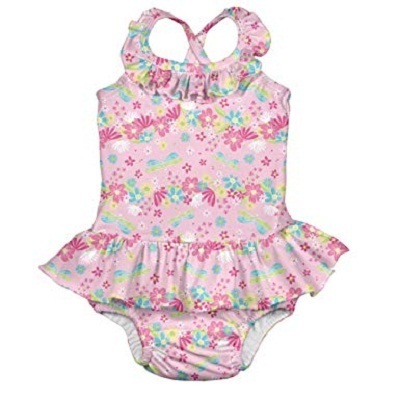 It can be reused and does not need a diaper or another swimsuit while your little daughter splashes around. It uses polyester and elastane for the swimsuit and polyester with nylon for the diaper padding. The diaper is pull-on, skin friendly, and machine-washable. The snug fit ensures that any surprise is nicely contained, but does not swell or sag. Lightweight, stylish, and available in many prints and colors. Designed with three layers to cater to your baby’s need. Waterproof, wicker-liner prevent skin rash. It could leak if the correct size is not selected. Extreme conditions can ruin the elastane. The two-in-one function of this swim diaper is sure to make your daughter look cute as a button. The lightweight product makes it a great choice for travel. Nageuret Swim diaper is gender neutral and environment-friendly. It is ideal for long hours in the water for kids. Nageuret guarantees no spillage in case of a surprise incident. 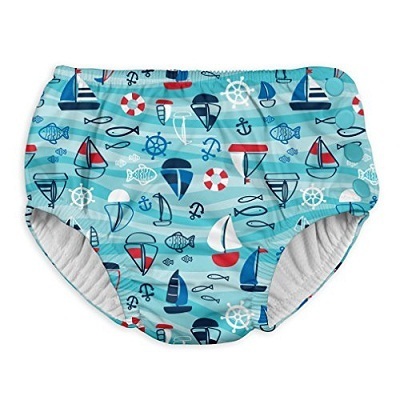 These multi-printed swim diapers are easy to wash, waterproof, and made with polyester. This makes them breathable and gentle on baby skin. Easy-to-operate snaps will lock the product in place and will prevent it from riding up. Fits well if correct size is chosen. Can be adjusted easily for a growing baby. Several sizes for different ages. Largely dependent on what size is picked. Handle with care for durability. This diaper does not wear or tear easily. Adjustable fit makes this quite popular amongst parents. The last pick of this list is especially for very young children, two months or even less. These have been designed extra small to facilitate kids to have an easy time in the water, without having to worry about rashes. Comfortable and snug fit, the diaper has been made with high-absorbent material that will last your kid long. Stretches from all sides for easy wear or take off. Does not swell or bloat. Disposable to make things convenient. Should be appropriately disposed to avoid stench and diseases. Disposable diapers contribute to environmental pollution. The easy usage coupled with special design for extremely young kids makes this a very good choice. The stretchable function allows your baby to move freely. Regardless of which choice you make from our top picks, the worry of discomfort and infection should not come to your mind while letting your children play in the water. Invest smart and live well!